The text read: “You’ll know this Simon, where do I get a great umbrella in London?” It was from my cousin Harry, but I’m embarrassed to say I didn’t know what to answer. Being absent-minded at the best of times, I’ve never spent more than five pounds on an umbrella. Even the free brollies from various law firms that litter the office get lost. I take them out when it’s raining, and they get left on the tube, the bus, the Pret a Manger counter. I once bought what seemed a rather nice umbrella from Muji for five pounds. Full-length, a mossy green and smart without being boring. It got left on the bus on the way home. The only thing he could tell me was that it was on New Oxford Street. But a bit of research easily identified his find as James Smith & Sons, purveyors of fine umbrellas, sticks and canes since 1830. From the website it looked as though most of the umbrellas would be out of my price range. With city umbrellas starting at £79, it would be foolish to spend that amount of money on something that could be lost of the train back to Dulwich. For the sake of research more than anything else, I wandered in there last week – not intending to buy anything, but merely to gain sufficient knowledge of the place to be able to answer a text (and perhaps its detailed follow-up) the next time around. The inside felt practical. Rough and ready, with a taste of sawdust in the air. Somehow, a place so unpretentious makes you feel that you are implicitly getting value for money. The sheen and gloss of a fashion brand may seem alluring, but you know you’re paying a sizeable premium for that excitement, that sense of belonging. At no point does it seem honest. 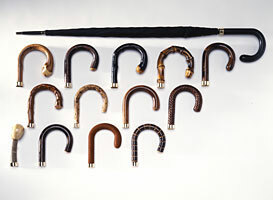 Anyway, turns out James Smith does a rather nice range of city umbrellas that start at £39. For your handle there’s a choice of cane, redwood and a rather rough wood that looks as if has just been hacked off a nearby trunk. They are long-lasting, and can be repaired at any time on site. I opted for redwood, and am rather pleased with it. It’s lovely to extend that feeling of luxury or tradition to another part of your attire. I really hope I don’t leave it on the train. You can follow the discussion on A good, honest umbrella by entering your email address in the box below. You will then receive an email every time a new comment is added. These will also contain a link to a page where you can stop the alerts, and remove all of your related data from the site. There’s a great selection at James Smith & Sons, and they should cut it your precise length. It’s interesting to read this again, ten years after it was written and see all the changes – your writing style, your knowledge, and even yourself. Thank you for keeping this pursuit alive after all these years. Everything you have continues to be a valubale resource for this interest of mine in classic menswear and style! This is a little unrelated, but it seems to me that all the posts from the past aren’t available, or at least not easily found unless a specific search was performed? I only see certian posts from each year instead of the entire listing in the archive. Is this intentional or am I missing something that could bring someone to each sequential post? My apologies if you’ve answered this before. I’m so pleased you’ve always found it so useful. On the homepage at the bottom of the list of posts there is a link that says ‘View all posts’. Sorry it’s not very obvious! Got it. No need to apologize. It’s obvious enough – just an oversight on my part when looking at the archive. Thanks for the help. I’ve recently found your site and am much enjoying it. May I suggest you point Harry towards Swaines if he feels like exploring umbrellas further? My father gave me his umbrella (from Swaine, Adeney and Brigg, bought in the 1951) when I started work in London, long after he had retired. (Briggs were the umbrella makers). It was “borrowed” by a work colleague and subsequently lost but he was honest enough to replace it like-for-like and, 25 years on, I continue to enjoy using it’s successor. Also from Swaine, Adeney and Brigg (then housed with Herbert Johnson, Hatters, in St. James’s) with a Malacca cane handle on a wooden shaft, a silver collar (for hand engraved initials) and a black silk canopy. It was somewhere in the region of £350 then. It’s beautiful and a great pleasure to use. Don’t leave your’s on the bus!